Eukarytotic cells have developed a highly conserved network of processes to ensure that the damaged genome is repaired before replication or mitotic segregation. This protective mechanism is essential for maintaining genomic integrity and stability, cell viability, and prevention of mutations. The drugs used in the treatment of human malignancies are invariably genotoxic, and their effectiveness is limited by a variety of factors. The most important factor is the tumor cells’ resistance to drugs. Most tumor cells could develop resistance to chemotherapeutic agents, whereas some malignant cells, including prostate carcinomas, melanomas, and gliomas, are intrinsically resistant to most antitumor drugs. For instance, ovarian and small-cell lung cancers are known to respond well to drug treatment initially, only to relapse with the appearance of drug-resistant cells. 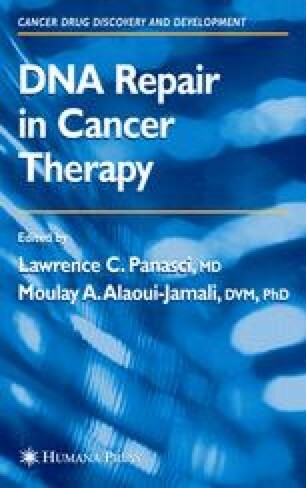 This acquired drug resistance resulting from genomic instability and consequent plasticity of the genome is encountered in approx 40% of all cancer patients undergoing chemotherapy.